Is Final Fantasy XIV Coming to the PS4? Somebody Asked That Question. Final Fantasy XIV's road to the PS3 has been rough. But now that the game is finally coming to the PlayStation 3, Square Enix's Yoichi Wada was asked whether or not the game is headed to the PS4. "Basically," said Wada, "I want to offer it through any means possible, but only after we've nailed the PS3 version we promised everyone." Naoki Yoshida, Final Fantasy XIV's game director, added that after the PS3 version is optimized and successfully launched later this year as FFXIV: A Realm Reborn, if they have the chance, he'd like to discuss it then. So, yeah. 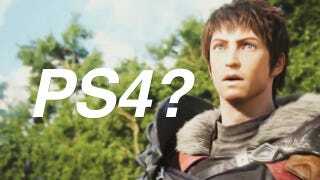 The PS4 was just announced. The PS3 version of Final Fantasy XIV isn't out yet. Everyone chill. Read Kotaku's previous coverage on what went wrong with Final Fantasy XIV.